It was a Tuesday morning, the week before Christmas, that Laura decided to take me shopping to buy a jacket. This was to be a gift for me, but I had to go to try it on. You see, I'm very fussy. It has to be the right size, color, and length or Laura would get sick of hearing me complain. Since we would be out early (before noon is early for us), we decided a good breakfast was in order. 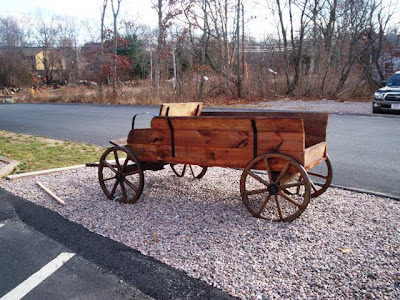 I thought of Susan's Restaurant, a lovely-from-the-outside looking place in nearby Tiverton, that we'd seen but never visited. It looks like a large log cabin decorated in a country motif, and is quite beautiful. We entered around 11:50 a.m. and were immediately struck by how beautiful, rustic, and charming this restaurant looks. 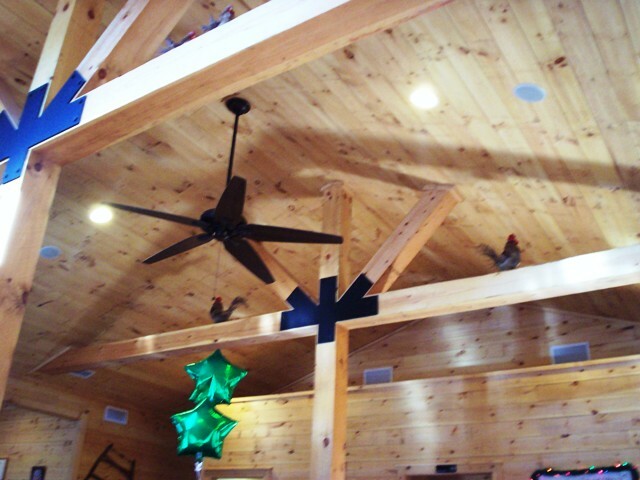 It's all wood - the floors, walls and beamed, high ceiling. 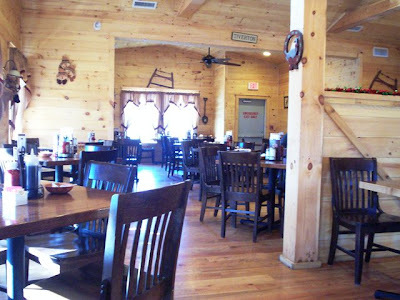 The rafters hold stuffed roosters, the walls hold various country plaques and dolls, and the entire restaurant is filled with lovely wooden tables and chairs. I immediately told Laura that I'd love to turn this place into a house - for me. As we waited to be seated, I was planning how I'd have my open kitchen lead into a large living area, LOL! After being seated by a friendly waitress, we were given menus and brought our requested coffees. The mugs were cute and large, and the coffee hot and good. 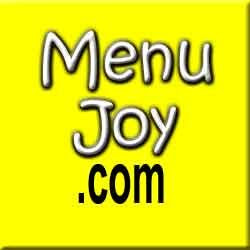 The menu is not huge, but it contains everything you could ask for in a good breakfast. 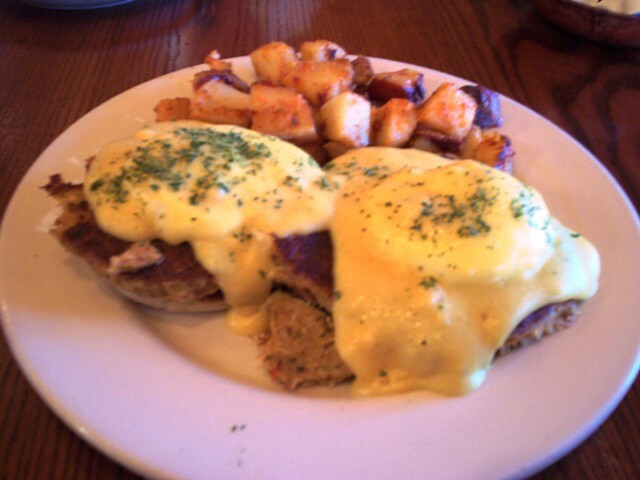 There were egg dishes like Benedicts with either Canadian bacon or crab cakes. There were several omelets like spinach and mushroom, veggie, or the ever-popular Western. There are pancakes and French toast. 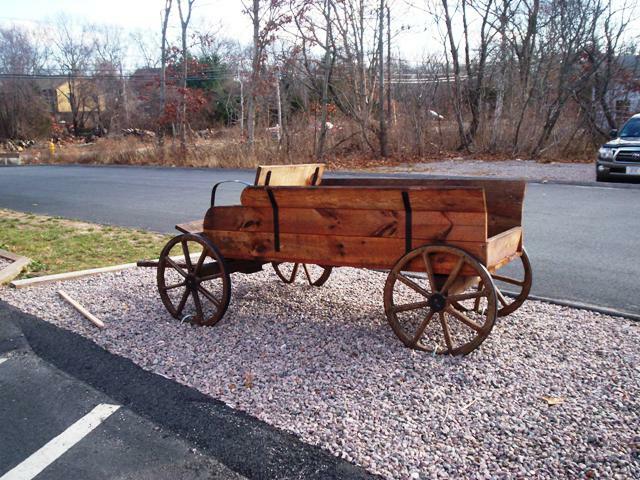 Plus, there are every manner of egg sandwiches, sides (corned beef hash, bacon, home fries, etc.) and some breakfast pastries (cinnamon rolls, bagels, muffins etc.). Laura decided on Susan's crab cakes which consisted of two crab cakes topped with poached eggs and Old Bay Hollandaise sauce on an English muffin with home fries or shreds (shredded potatoes). She chose the home fries. It arrived beautifully displayed and Laura dug in. Delicious! She was very pleased with her choice. Laura said the crab cakes were nicely spiced and so tasty. The eggs were done perfectly and her home fries (red potatoes) were also nicely spicy. This was a terrific breakfast. I chose the sweet bread French toast. This consisted of three thick slices of Portuguese sweet bread done up as French toast. I had a choice of fruits (if I so desired) and I chose apples. I also got a side of bacon (I needed some protein for that shopping later). Wow! This platter was huge. 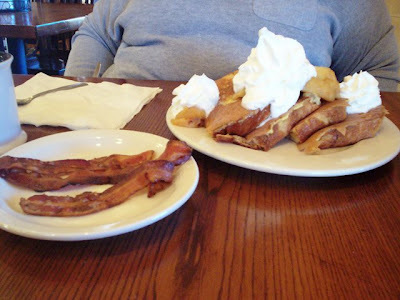 The slices of French toast were very large and were covered by my cooked apples and several blobs of whipped cream. It tasted as amazing as it looked. The toast were done perfectly, as were the apples, and the cream cancelled any need for additional butter or syrup. The three strips of bacon were meaty and done perfectly. What a special meal. Susan's also has a lunch/dinner menu that, while not large, carries some unique choices. They have a few starters like buffalo tenders, mozzarella sticks, stuffies, onion rings, and quesadillas; as well as some soup like clam chowder, kale soup, Texas chili; and various salads. They have burgers and dogs and some sandwiches like the BLT, chicken, fish, and roast beef. They also have a nice collection of comfort foods like country fried steak, French meat pie, pork chops, liver and onions, chicken parmigiana, and Susan's meatloaf. 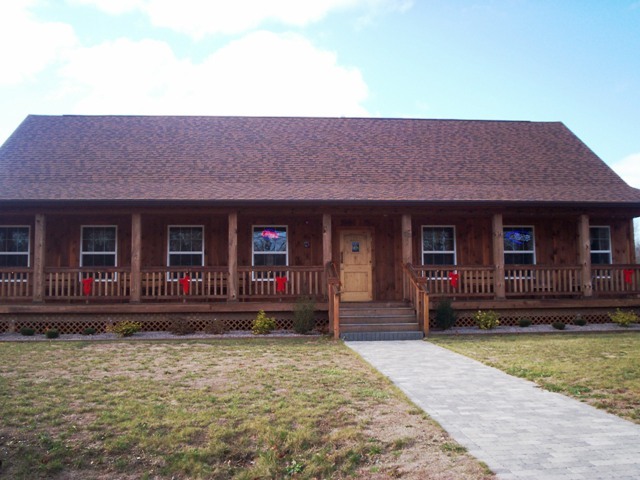 On the seafood side, they have fish and chips, fried shrimp and scallops, and baked scrod. I can't wait to stop by some time for lunch. If it's as good as the breakfast was, then we're in for a treat. 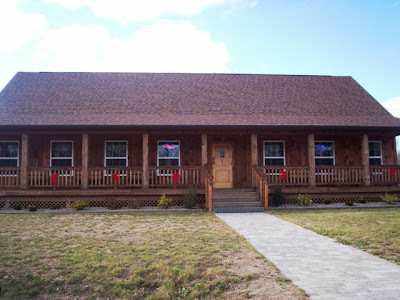 I highly recommend Susan's Restaurant for a great meal at terrific prices, but don't be surprised that while you're sitting there, you start planning how to turn the place into your own log cabin paradise. I did! We left $24.10 on the table for our friendly waitress. As is our habit we checked out their restroom before we left and found it as lovely and immaculate as the rest of the place. ... and good news! We found a jacket at the first shop. Yeah! 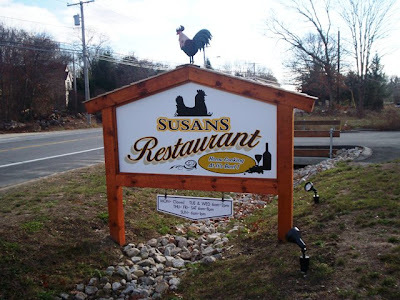 Susan's Restaurant is open from 6 a.m. to 2 p.m. Tuesday and Wednesday, 6 a.m. to 8 p.m. Thursday through Saturday, and 6 a.m. to 1 p.m. Sunday. The restaurant is closed on Monday.